Buffalo Bill making his characteristic "entrance" in his "Wild West Show"—as he is best remembered by admiring multitudes in America and Europe. Above—Cody and Sitting Bull, before the great chief turned "bad." In his first Indian fight, barricaded by three dead mules, when he was 11 years old. Above—William F. Cody as an army scout shortly after the close of the civil war. WITH the passing of "Buffalo Bill" disappears the one great, vivid personality which remained as a living link between the present generation and the courageous picturesque founders of that now rich and civilized American empire that was the "Wild West." 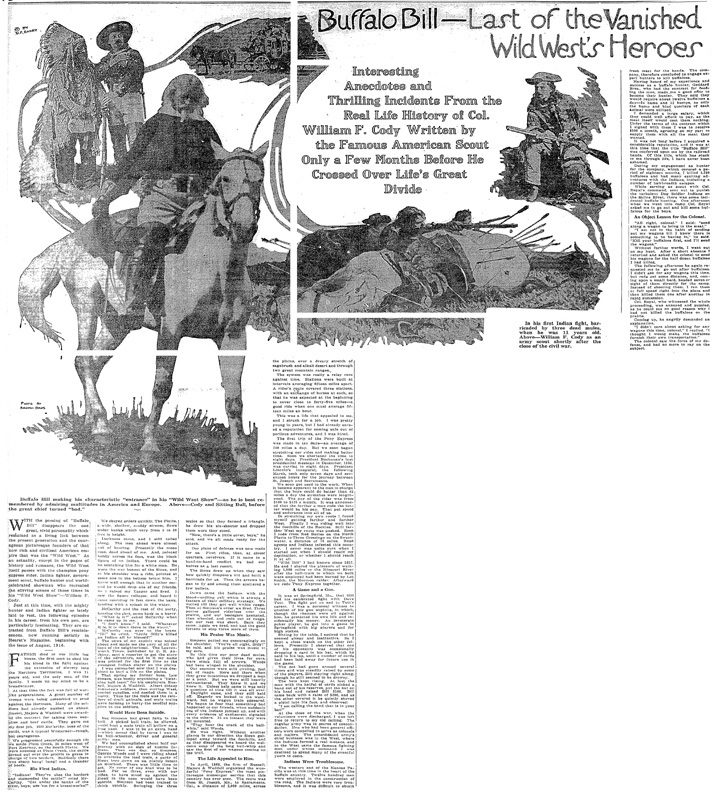 As an actuality, except in the pages of history and romance, the Wild West itself passes with the champion pony express rider, Indian fighter, government scout, buffalo hunter and world-celebrated showman who recreated the stirring scenes of those times in his "Wild West Show"—William F. Cody. Just at this time, with the mighty hunter and Indian fighter so lately laid to rest, the following episodes in his career, from his own pen, are particularly fascinating. They are extracted from Buffalo Bill's reminiscences, now running serially in Hearst's Magazing, beginning with the issue of August, 1916. FATHER died in our little log house, the first man to shed his his blood in the fight against the extension of slavery into the Northern Territories. I was 11 years old, and the only man of the family. I made up my mind to be a breadwinner. At that time the fort was full of war-like preparations. A great number of troops were being assembled to send against the Mormons. Many of the soldiers had already pushed on ahead. Russel, Majors & Waddell were awarded the contract for taking them supplies and beef cattle. They gave me my first job. Bill McCarthy, boss of the outfit, was a typical Westerner—rough, but courageous. We progressed peacfully enough till we made Plum Creek, 36 miles west of Fort Kearney, on the South Platte. We were nooning at Plum Creek, the cattle spread out over the prairie to graze in charge of two herders. Suddenly there was a sharp bang! bang! and a thunder of hoofs. "Indians! They've shot the herders and stampeded the cattle!" cried McCarthy. "Get under the banks of the river, boys;' use 'em for a breastworks!" We obeyed orders quickly. The Platte, a wide, shallow, muddy stream, flows under banks which vary from 5 to 30 feet in height. Darkness came, and I still toiled along. The men ahead were almost out of hearing. Presently the moon rose, dead ahead of me. And, painted boldly across its face, was the black figure of an Indian. There could be no mistaking him for a white man. He wore a war bonnet of the Sioux, and at his shoulder was a rifle, pointed at some one in the bottom below him. I knew well enough that in another second he would drop one of my friends. So I raised my Yaeger and fired. I saw the figure collapse, and heard it come tumbling 30 feet down the bank, landing with a splash in the water. "What is it?" asked McCarthy when he came up to me. McCarthy ran over to the brave "Hi!" he cried. "Little Billy's killed an Indian all by himself!" The news of my exploit was noised about and made me the envy of all the boys of the neighborhood. 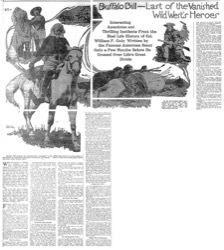 The Leavenworth Times, published by D. R. Anthony, sent a reporter to get the story of the adventure, and in it my name was printed for the first time as the youngest Indian slayer on the plains. That spring my former boss, Lew Simson, was busily organizing a "lightning bull team" for his employers, Russell, Majors & Waddell. Albert Sidney Johnston's soldiers, then moving West, needed supplies, and needed them in a hurry. Thus far the mule was the reindeer of draft animals, and mule trains were forming to hurry the needful supplies to the soldiers. But Simpson had great faith in the bull. A picked bull train, he allowed, could beat a mule train all hollow on a long haul. I was to be an extra hand—which meant that by turns I was to be bull-whacker, driver and general utility man. "Now, there's a little cover, boys," he said, and we all made ready for the attack. Our plans of defense was now made for us. First rifles, then, at closer quarters, revolvers. If it came to a hand-to-hand conflict we had our knives as a last resort. The Sioux drew up when they saw how quickly Simpson's wit had built a barricade for us. Then the arrows began to fly and among them spattered a few bullets. By this time our poor dead mules, who had given their lives for ours, were stuck full of arrows. Woods had been winged in the shoulder. Our enemies were still circling, just out of range. Here and there when they grew incautious we dropped a man or a pony. But we were still heavily outnumbered. They knew it and we knew it. Unless help came it was only a question of time till it was all over. Daylight came, and they still held off. Eagerly we looked to the westward, but no wagon train appeared. We began to fear that something had happened to our friends, when suddenly one of the Indians jumped up, and with every evidence of excitement signaled to the others. In an instant they were all mounted. "They hear the crack of the bullwhip," said Woods. He was right. Without another glance in our direction the Sioux galloped away toward the foothills, and as they disappeared we heard the welcome snap of the long bull-whip and saw the first of our wagons coming up the trail. The Life Appealed to Him. In April, 1860, the firm of Russell, Majors & Waddell organized the wonderful "Pony Express," the most picturesque messenger service that this country has ever seen. The route was from St. Joseph, Mo., to Sacramento, Cal., a distance of 2,000 miles, across the plains, over a dreary stretch of sagebrush and alkali desert and through two great mountain ranges. The system was really a relay race against time. Stations were built at intervals averaging fifteen miles apart. A rider's route covered three stations, with an exchange of horses at each, so that he was expected at the beginning to cover close to forty-five miles—a good ride when one must average fifteen miles per hour. This was a life that appealed to me, and I struck for a job. I was pretty young in years, but I had already earned a reputation for coming safe out of perilous adventures, and I was hired. The first trip of the Pony Express was made in ten days—an average of 200 miles a day. But we soon began stretching our rides and making better time. Soon we shortened the time to eight days. President Buchanan's last presidential message in December, 1860, was carried in eight days. President Lincoln's inaugural, the following March, took only seven days and senventeen hours for the journey between St. Joseph and Sacramento. We soon got used to the work. When it became apparent to the men in charge that the boys could do better than 45 miles a day the stretches were lengthened. The pay of the rider was from $100 to $125 a month. It was announced that the farther a man rode the better would be his pay. That put speed and endurance into all of us. In stretching my own route I found myself getting farther and farther West. Finally I was riding well into the foothills of the Rockies. Still farther West my route was pushed. Soon I rode from Red Buttes on the North Platte to Three Crossings on the Sweetwater, a distance of 76 miles. Road agents and Indians infested this country. I never was quite sure when I started out when I should reach my destination, or whether I should reach it at all. "Wild Bill" I had known since 1857. He and I shared the pleasure of walking 1,000 miles to the Missouri River after the bull-train in which we both were employed had been burned by Lot Smith, the Mormon raider. Afterward we rode Pony Express together. A Game and a Gun. It was Springfield, Mo., that Bill had his celebrated fight with Dave Tutt. The fight put an end to Tutt's career. I was a personal witness to another of his gun exploits, in which, though the chances were all against him, he protected his own life and incidentally his money. An inveterate poker player, he got into a game in Springfield with big players and for high stakes. Sitting by the table, I noticed that he seemed sleepy and inattentive. So I kept a close watch on the other fellows. Presently I observed that one of his oponents was occasionally dropping a card in his hat, which he held in his lap, until a number of cards had been laid away for future use in the game. The pot had gone around several times and was steadily raised by some of the players, Bill staying right along, though he still seemed to be drowsy. "I am calling the hand that is in your hat!" At the close of the war, when the volunteers were discharged, I was left free to return to my old calling. The regular army was in course of consolidation. Men who had been general officers were compelled to serve as colonels and majors. The consolidated army's chief business was in the West, where the Indians formed a real menace, and to the West came the famous fighting men under whose command I was destined to spend many of the eventful years to come. The western end of the Kansas Pacific was at this time in the heart of the buffalo country. Twelve hundred men were employed in the construction of the road. The Indians were very troublesome, and it was difficult to obtain fresh meat for the hands. The company, therefore concluded to engage expert hunters to kill buffaloes. Having heard of my experience and success as a buffalo hunter, Goddard Bros., who had the contract for feeding the men, made me a good offer to become the hunter. They said they would require about twelve buffaloes a day—24 hams and 12 humps, as only the hump and hind quarters of each animal were utilized. I demanded a large salary, which they could well afford to pay, as the meat itself would cost them nothing. Under the terms of the contract which I signed with them I was to receive $500 a month, agreeing on my part to supply them with all the meat they wanted. It was not long before I acquired a considerable reputation, and it was at this time that the title "Buffalo Bill" was conferred upon me by the railroad hands. Of this title, which has stuck to me through life, I have never been ashamed. During my engagement as hunter for the company, which covered a period of eighteen months, I killed 4,280 buffaloes and had many exciting adventures with the Indians, including a number of hairbreadth escapes. While serving as scout with Col. Royal's command, sent out to punish the turbulent Dog Soldier Indians on the Saline River, there was some incidental buffalo hunting. One afternoon when we went into camp Col. Royal asked me to go out and kill some buffaloes for the boys. An Object Lesson for the Colonel. "All right, colonel," I said: "send along a wagon to bring in the meat." "I am not in the habit of sending out my wagons till I know there is something to be hauled in," he said. "Kill your buffaloes first, and I'll send the wagons." Without further words, I went out on my hunt. After a short absence I returned and asked the colonel to send his wagons for the half dozen buffaloes I had killed. The following afternoon he again requested me to go out after buffaloes. I didn't ask for any wagons this time, but rode out some distance, and, coming upon a small herd, headed seven or eight of them directly for the camp. Instead of shooting them, I ran them at full speed right into the place and then killed them one after another in rapid succession. Col. Royal, who witnessed the whole proceeding, was annoyed and puzzled, as he could see no good reason why I had not killed the buffaloes on the prairie. Coming up, he angrily demanded an explanation. "I didn't care about asking for any wagons this time, colonel," I replied. "I thought I would make the buffaloes furnish their own transportation." The colonel saw the force of my defense, and had no more to say on the subject.